From left, Gary Kersey, GOP Chairman Tim Inwood, and Dr. Mary Lou Inwood holding a cane made from wood taken from the Lincoln birthplace cabin. The Clinton County Republican Party held its annual Century Club dinner on Monday, Jan. 14 at the Spillway Lodge. Approximately 100 guests were entertained by a keynote address given by Gary Kersey. The noted Abraham Lincoln scholar discussed Lincoln artifacts from his personal collection. Items of interest included an autographed portrait of Mrs. Lincoln and a cane made of wood from the Lincoln birthplace cabin. When the shrine to the birthplace was built, it was too small for the cabin, so the cabin had four feet shaved off one side, hence the creation of objects like the cane in Mr. Kersey’s possession. It was a fascinating speech, and a great time was had by all in attendance. 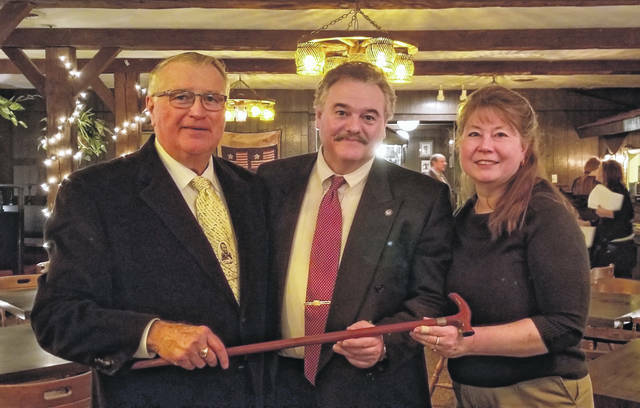 https://www.wnewsj.com/wp-content/uploads/sites/22/2019/01/web1_20190114_205219.jpgFrom left, Gary Kersey, GOP Chairman Tim Inwood, and Dr. Mary Lou Inwood holding a cane made from wood taken from the Lincoln birthplace cabin.